Ragan Gennusa Hand Signed and Numbered Limited Edition Canvas Giclee:"Pardners"
Size: 24" x 16", 36" x 24", 48" x 32" and 60" x 40" - Select option from drop down box. From the Artist: Ragan was born in Rosebud, Texas in 1944 and the following year, his family moved to Port Arthur, Texas. Raised by parents who never missed an opportunity to go fishing, camping or simply spend time outdoors experiencing nature, Ragan was exposed to a variety of Texas geography through his childhood. He began sketching and drawing at an early age, and he credits his mother with encouraging him to draw the images that most intrigued him - from the Texas Gulf Coast to his Grandparents' farm in Rosebud. Before finishing high school, Ragan knew that he wanted more than anything to be an artist. His love of the outdoors extended to athletics as well. Ragan was All-state in track and was an All-state quarterback for Port Arthur High School and attended the University of Texas on a football scholarship where he studied art. Ragan credits his training as an athlete for teaching him to value "courage, tenacity, discipline, and the importance of character in pursuit of life as well as an artistic career". Ragan graduated from U. T. with a Bachelor's of Fine Arts degree determined to find his way as an artist. He passed on higher paying jobs to work as an artist for an Austin printing company. He was making much less but stuck with the job that was closest to his heart and enabled him to pursue his career as an artist. From there, he went to work for the Texas Parks and Wildlife Department. Before long, he was promoted to Artistic Director, but on the condition that hebe allowed to continue painting along with accepting the additional administrative duties. While at Texas Parks and Wildlife, Ragan created the first Texas conservation stamp for the white-winged dove. Ragan left the parks and Wildlife Department to paint exclusively for art galleries in Austin and Houston where his art became collected and known to collectors throughout the southwest. In 1976, Ragan became a charter member of the Gulf Coast Conservation Association when they asked him to donate some of his work for their initial fundraiser. As he became increasingly involved with GCCA and other conservation groups, Ragan's reputation as an artist and an outdoorsman grew. Before long, patrons were commissioning paintings that allowed him to travel across the country, exploring his interest in the early settlers and native American cultures. Ragan feels a deep connection with these people because, as he puts it, "we've lived on the same land". In 1986, Ragan was honored by the State Legislature's selecting him as the 1986-87 Texas State Artist. In 1993 and 1999, Ragan's art was selected for the Texas Turkey Stamps. Several of his paintings are prominently displayed in the University of Texas Alumni Center and he has done paintings for the University of Texas football program. In 1993, Ragan was commissioned to paint a series of paintings by New York Life Insurance Company to commemorate their 150th anniversary. Prints of the paintings were made available for company agents. Four original paintings hang in the company's New York office. Today, the land Ragan lives on is in the hill country outside of Dripping Springs, Texas in the ranch house he built. Ragan paints mostly on commissions in a studio filled with a sense of the West. 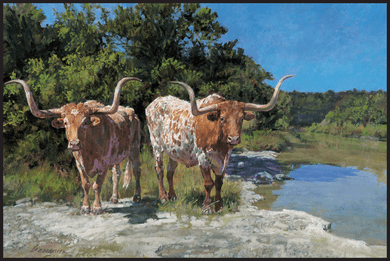 Gennusa says, "�after a particularly good day of painting, I walk out of my studio overlooking the beautiful Texas Hill Country and I truly feel that I am the richest, luckiest man on earth!